Eric R. Kandel will discuss and sign copies of his latest book, Reductionism in Art and Brain Science, in a free, public lecture. RSVPs are requested. 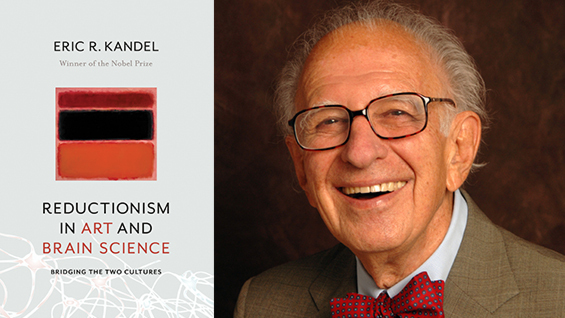 In the book, Dr. Kandel demonstrates how science can inform the way we experience a work of art and seek to understand its meaning. He illustrates how reductionism—the distillation of larger scientific or aesthetic concepts into smaller, more tractable components—has been used by scientists and artists alike to pursue their respective truths. Dr. Kandel draws on his Nobel Prize-winning work revealing the neurobiological underpinnings of learning and memory in sea slugs to shed light on the complex workings of the mental processes of higher animals. He demonstrates through bottom-up sensory and top-down cognitive functions how science can explore the complexities of human perception and help us to perceive, appreciate, and understand great works of art. Kandel explains how, in the postwar era, Pollock, de Kooning, Rothko, Louis, Turrell, and Flavin used a reductionist approach to arrive at their abstract expressionism and how Katz, Warhol, Close, and Sandback built upon the advances of the New York School to reimagine figurative and minimal art. Eric R. Kandel is University Professor and Kavli Professor in the Departments of Neuroscience, Biochemistry and Molecular Biophysics, and Psychiatry at Columbia University. He is director of the Kavli Institute for Brain Science and co-director of the Mortimer B. Zuckerman Mind Brain Behavior Institute at Columbia. In 2000, he was awarded the Nobel Prize in Physiology or Medicine.